In this module we will discuss how to choose ranges over which to sample parameters using the graphical Monte Carlo method for fitting the parameters of a mathematical model to data. We will also discuss the importance of using the Normal negative log-likelihood statistic (equivalent to Least Squares) when doing Least Squares fitting, rather than the Least Squares statistic itself. In this module, we will discuss the graphical Monte Carlo parameter optimisation procedure using Uniform random sampling of the parameter hypotheses, and compare and contrast this method with the graphical Latin hypercube method. Posted in R	| Enter your password to view comments. In this module, intended for students at ASU, we discuss how to use ASU high performance computing resources to run an R script on many CPU’s simultaneously. Compartmental models of infectious disease transmission inherently assume that the time spent (“sojourn time”) in the infectious state is Exponentially distributed. As we will discuss in this module, this is a highly unrealistic assumption. We will show that the “linear chain rule” can be used to incorporate more realistic probability distributions for state sojourn times into compartmental mathematical models. In this module, I provide an example LaTex document that cites references within a BibTex file, and also includes examples of how to include equations, figures, and tables. The repository contains the main LaTex document example_latex.tex, along with the bibtex file example_latex.bib. In order to compile the document, you also need to download the example_latex_histogram_plot.eps, which is the figure included in the file. To compile the document, run LaTex once, then BibTex, then LaTex twice (which should resolve all references). Note that the encapsulated postscript (EPS) figure for the paper was produced with the R script example_latex.R (you need to install the R extrafont library before running the script) The R script also shows you how to automatically output results from your analysis code that can be included as \newcommands in your latex file that allow you to copy and paste the results to your LaTex file so that reference those results in the text of your paper without having to manually transcribe numbers (which can lead to unnecessary transcription errors). 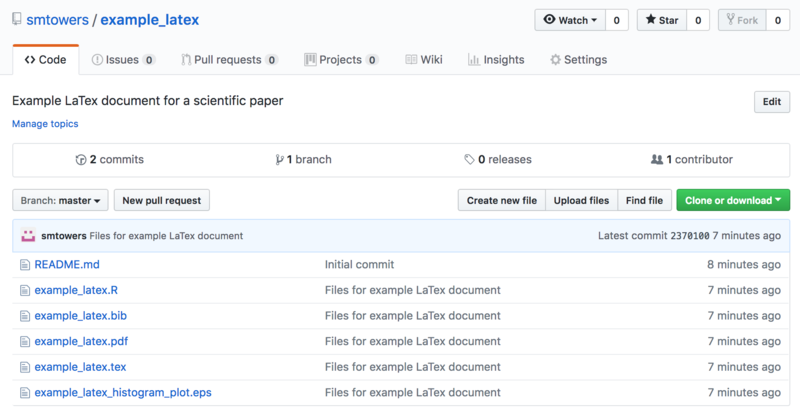 GitHub is a web-based version-control and collaboration platform for software developers. Git, an open source code management system, is used to store the source code for a project and track the complete history of all changes to that code. It allows developers to collaborate on a project more effectively by providing tools for managing possibly conflicting changes from multiple developers. GitHub allows developers to change, adapt and improve software from its public repositories for free. Repositories can have multiple collaborators and can be either public or private. Computational and statistical methods for mathematical biologists and epidemiologists. In this module, we’ll discuss how to make your own R library package, and how to upload it to the R CRAN repository. In this module we will discuss numerical methods that can be used to calculate the 95% CI on data that has been transformed by some function, if one knows the probability distribution underlying the stochasticity of the original data. In this module, students will become familiar with the importance of, and methods for, model validation.